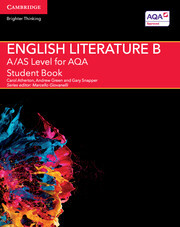 Written by an experienced author team, this brand new series of blended print and digital resources has been specifically developed for the AQA AS/A Level English qualifications, for first teaching from September 2015. Supporting students at every stage of the new two-year linear course, these resources help bridge the gap from GCSE to A level and prepare students for possible study beyond A level. These resources will help students develop and extend their skills through practical activities and signposted wider reading, challenging and stretching students, preparing them for higher education and giving them access to leading figures in the worlds of literature and language. Every copy of the print Student Book comes bundled with a digital subscription and the Teacher’s Resource is free. 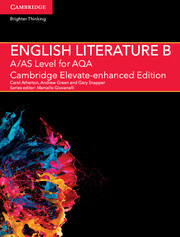 From discussing poetic interpretations to the analysis of thematic structure, our English literature resources include considered approaches to classic texts, developing skills at the Cambridge IGCSE®, O Level, A Level and IB Diploma stages of learning. Contemplate the messages of love, family and society within poetry from around the world, expose unseen comparisons in Chaucer’s works, apply critical thinking to the language of drama, and identify parallelism and enjambement in D. H Lawrence’s Mountain Lion. Our English literature resources encourage students to develop deeper understandings of different periods in English literature, and make informed decisions regarding context, semantics and writerly choices.